Arrival to Zagreb airport. You will be met at the airport and transferred to the hotel of your choice. Rest of the day is at leisure. Overnight. Breakfast. Today we shall proceed for the Zagreb city tour. Visit the Upper Town with its Gothic Cathedral, the beautiful and ornate St. Catherine's church or the massive St. Mark's church with its famous color-tiled roof. Continue to the medieval Stone Gate and "Dolac", the open-air market which are a must for all visitors. Rest of the day free to explore the city on own. Overnight. Breakfast. Transfer from Zagreb to Plitvice (duration approx. 2hrs). 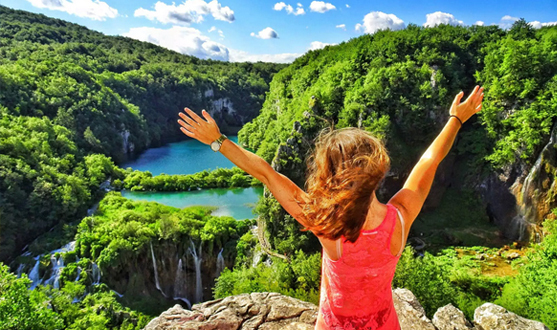 Visit of the Plitvice National Park is one of the most beautiful and best preserved national parks in the country. It is a valley situated between high forested mountains in which lie, one below another, a string of sixteen beautiful lakes of crystal blue and green waters. Fed by small streams and brooks, they spill into each other in 92 foaming cascades and thundering waterfalls. The Plitvice lakes` scenery will simply delight you regardless whether you are walking the paths and wooden bridges, taking a boat ride or just taking photographs. Transfer continues to Split. Overnight. Breakfast at the hotel. 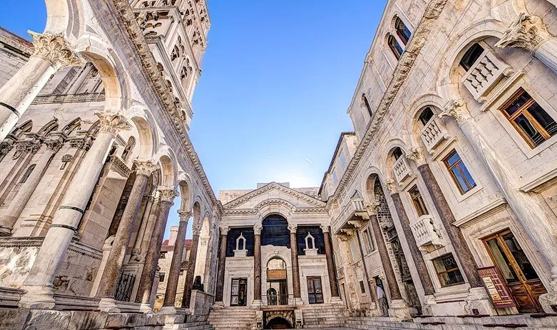 The Split private tour will take you along the Old City to visit main sights: the old town of Split is built on and around the spectacular Roman Palace erected By the Roman Emperor Diocletian in the 4th century. The walking tour starts with a visit to the cellars of the Palace that are still very well preserved. The cellars offer a good view at how the life in the Palace was organized. The Cathedral St. Duje is a complex of a church, Formed from an Imperial Roman mausoleum, with a bell tower; strictly the church is dedicated to the Virgin Mary, and the bell tower to Saint Duje. Together they form the Cathedral of St. Duje. The Jupiter's Temple is a temple dedicated to the god Jupiter of the ancient Romans, located near the Peristyle, the central square of the palace. It was built during the entire construction of Diocletian's Palace. At the entrance to the temple is one of the two sphinxes brought out of Egypt by the order of Emperor Diocletian. Other sites will be seen along the way. Overnight. Breakfast. Transfer from Split to Dubrovnik today morning. In the afternoon we shall proceed for the Dubrovnik sightseeing tour.... those who seek paradise on Earth should come to Dubrovnik» (George Bernard Shaw). The walking portion includes visits to the Dominican Monastery with its fine collection of medieval paintings. Our guide will lead you through the narrow streets of the Old Town introducing you to the history and culture of this magnificent city. Other buildings will be viewed along the way. Overnight. Breakfast. Rest of the day at leisure or Excursion to the island of Korčula with local guide. Korcula town is considered the birthplace of Marco Polo. Experience the narrow streets, churches and palaces in one of the best preserved Medieval towns in the Mediterranean. Our walking tour of the town will reveal some of the finest sites such as St Marc's Cathedral. After sightseeing – free time for lunch or even swimming. Overnight. Breakfast. Rest of the day at leisure or optional Excursion to Montenegro (Passport is obligatory). Located less than one hour's drive from Dubrovnik, Montenegro offers a natural beauty in combination with history and culture. 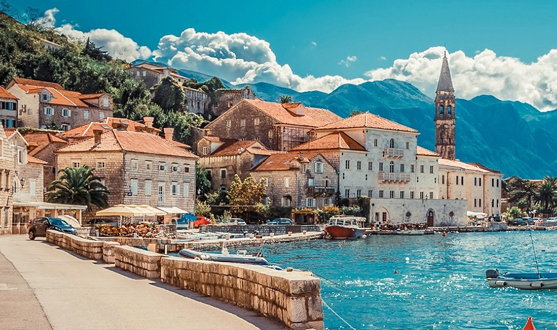 Enjoy the drive around the Kotor Bay with its numerous small settlements; stop in Medieval Kotor to soak in the typical Mediterranean lifestyle; continue to Budva, the ancient town which is today a lively tourist resort. Overnight. Breakfast at the hotel and then transfer from the hotel to the Dubrovnik airport. 7 nights' accommodation at the hotel of your choice. 2 nights Zagreb, 2 nights Split and 3 nights Dubrovnik. Private transfers in A/c vehicle between Zagreb – Split – Dubrovnik. Plitvice National Park with entrance fees. Split city tour with entrance fees to Diocletian's Park, Cathedral and Jupiter's temple. Dubrovnik sightseeing tour with entrance fees to Dominican Monastery.